The wave of satisfaction that rushes over you when you open your closet and see everything neatly organized, color-coded, and folded cannot be denied. So how can you keep all your prized possessions safe while also making the most out of your little slice of closet heaven? Now that you know how to care for your clothing, here are some sure-fire ways to keep your duds moth-free while also freeing up as much room as possible to fit your new gadgets, like the SWASH™ in-home clothing care system. This post is a sponsored collaboration between SWASH™ brand and Studio@Gawker. The easiest way to have more space is to have less stuff — it's just that simple. Go through your clothes and separate them by season, then break down the seasons by your staples. Is there anything in there you've had more than 2 months and never worn? Donate it. Anything you used to wear all the time and now can't stand the sight of? Donate that too. Be ruthless, but don't throw the baby-doll dress out with out with the bathwater. Last winter's most beloved sweater may have spent all of spring, summer, and fall gathering dust, wrinkles and a vaguely musty smell under your bed. But it can probably be rehabbed with a quick trip through the SWASH system. On the other hand, that shirt with the price tags still on it that you keep telling yourself you'll wear next time you're invited to a semi-formal square dance? Get it gone already. There are a lot of places to donate, from the Salvation Army to your local resale store — and as hard as it can be to part with the dress you wore on your first job interview, the thought that it could help someone less fortunate make a positive step in their lives is worth saying goodbye. When you're done slaying all the ghosts of clothing past, survey what you have left. Keep it separated by season and prepare to store what you won't be wearing in the coming months. Before you get started, there are some things you're going to need. Get thee to the Container Store! Hangers: Although it might seem unnecessary, the uniformity created by matching hangers helps maintain order in the Wild West that is your closet. Stock up on some nice wooden ones or this non-slip version, and please for all that is good, throw out those metal hangers you get from the dry cleaners. Shoe rack: Maximize space by organizing shoes vertically. Not having to dig around in the bottom of your closet will save you some backaches, and will make running out the door way easier. 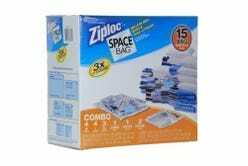 Space bags: These nifty organizational accessories will allow you to keep your out-of-season stuff safely tucked under your bed or up at the top of your closet. Under-bed storage: Don't let the precious floorspace under your bed go to waste. Unless you have a bed frame with storage built in, there's no reason not to keep your out-of-season duds underneath your sleeping space. You can also put the Space Bags into plastic storage containers, to keep it safe and organized. Accessory storage: Belts and scarves are some of the most annoying things to store. Stock up on some accessory loops so you can hang them right alongside your jackets and shirts. 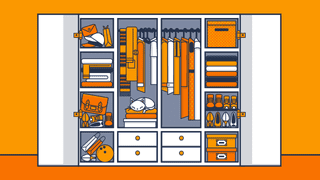 SWASH: A perfectly organized closet is great, but it's not much use if you're not taking the right care of your clothes. This bordering-on-miraculous device will simplify the process of keeping your clothes fresh without too much wear and tear, so that they spend more time hanging in your closet (or, better yet, on your person) than they do languishing at the the dry cleaner. One of the fastest ways to mess up a beautiful closet is by digging around to get something that's been buried way in the back. Sort the clothes that you're going to be storing from most worn to least, then create a map of your closet that will allow you to store your most used items (like shirts and dresses) at eye-level, less used items below, and least used items up above your hanging clothing. This way, you won't have to root around for the things you know you'll want to wear. You can hang scarves and belts on accessory loops, and keep bags and hats above your hanging clothing, since you switch those out less frequently. So what to hang and what to store folded in a dresser? The rule is to hang everything you can, with a few exceptions — if you can clearly see your clothes, you'll wear them more, and now that you're down to your favorite items, there should be plenty of room. One exception: fold heavy sweaters, so that they won't get all stretched out on hangers. Hang dresses by color rather than by length (it's easier on the eyes to keep everything color-coded), and hang pants using clips so they won't slip off. Pretty simple, right? The thing about closets is, once you have them under control, it doesn't take much to keep them that way. And if you're not spending all of your time trying to find your favorite dress in a pile of out-of-season junk, you'll have more time to actually, you know, live your life. Once you know what you're going to wear, use your new SWASH system to get clothes refreshed and ready to go in just 10 minutes. By properly storing your clothes and treating them with care, your life will be as wrinkle-free as it is organized. For more information on simplifying your clothing care routing with the SWASH system, head here. Maud Deitch is a Senior Content Producer at Studio@Gawker. She has written for SPIN, The FADER, MTV.com and other publications.